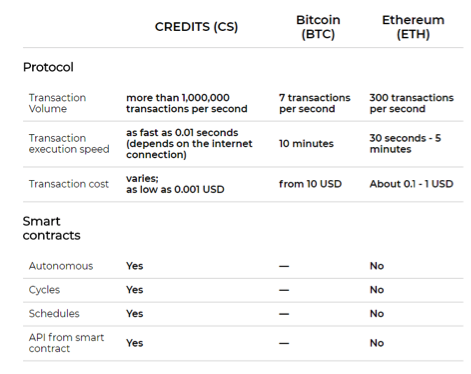 CREDITS is a public blockchain platform with autonomous smart contracts and an internal cryptocurrency. The platform is designed to create services for blockchain systems using self-executing smart contracts and a public data registry. The platform can execute more than 1,000,000 transactions per second at a execution speed of 0.01 seconds. Because transaction fees are minimal, high-volume applications are possible in a way that no other available blockchain (today) can match. What problems does Credits solve? Users and developers themselves face significant shortcomings in current blockchain operations. Current blockchains are characterised by slow transactions as well as high transaction fees. This is due to the fact that individual nodes (computers that perform verification and data transfers) are forced to process one transaction across the entire network. Because of this, current blockchains use a lot of electricity, the current bitcoin blockchain is said to consume the same amount of electricity as a country like Danmark. This leads to the need to charge unreasonably high transaction fees. These problems are a huge obstacle to the development of Bitcoin and Ethereum in a number of industries. Ethereum is currently being updated in order retain the leading position of blockchain network ranking. 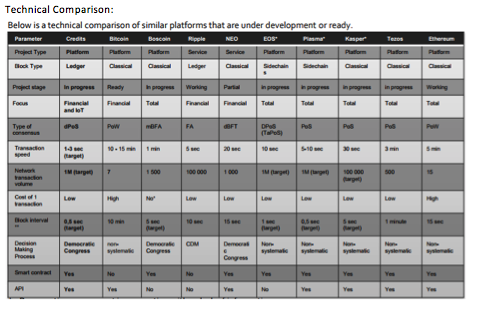 But until that time, other players may appear that will seriously compete with Ethereum. The CREDITS Blockchain aims to fill that void by implementing a new algorithm for reaching consensus. They reach consensus by combining PoW (Proof of Work) and Pos (Proof of Stake), using a modified FA consensus algorithm. New algorithm: The CREDITS Blockchain implements a new algorithm for reaching consensus. They reach consensus by combining PoW (Proof of Work) and Pos (Proof of Stake), using a modified FA consensus algorithm. No Mining: The project advantage is the independence from mining (there is none) and the DPoS (Delegated Proof-of-Stake) principle based operation. Transactions are transferred centralized for processing to the main node, where they are processed and written to the registry. This reduces transaction processing time. Higher throughput: Because they do not rely on mining for consensus CREDITS is able to process transactions up to up to 1 million T/Sec with a blockinterval of 3 sec. Autonomous Smart Contracts: Ethereum has limited smart contract facilities and cannot implement everything a developer may want to implement. For example, you cannot adjust regular debit payments or a fixed debiting date. The CREDITS platform is a full-scale and autonomous system that is able to perform all of these operations. Application Developer, Database Administrator, and Project Manager in a wide variety of business applications. Particularly interested in client/server and relational database design using Oracle, MS-SQL Server. Programming languages: C#, ASP.NET, С/С ++, Delphi, Php, VBA, and solidity. Producer of Cryptocurrency & Blockchain Technology Events throughout Europe. He is the founder and CEO of Dutch Finance Educational Platform ’Trading Seminars’. Arjan has more than 10 years of experience in private banking, asset & wealth management and investments in disruptive technologies. The team is supported by an advisory board with extensive experience in fintech and startups. How are CREDITS tokens used? To purchase information from third-party sources for services within the system. There are no vaiable solutions to solve the scalability and latency issues yet, although Ethereum is switching the network from PoW (Proof of Work) to Pos (Proof of Stake) and there there are some ongoing projects like EOS, Radix and Dragonchain that are trying to solve these issues, none of these have materialized yet. The project that goes live first and proves to be able to handle a large throughput will have a big advantage. Team: They have a dedicated and experienced team that has vast knowledge about Crypto and Blockchain technologies. Smart Contract: Developers may code smart contracts in Java, whichmeans access to a huge developer community, besides that, their smart contracts are more advanced than that of Ethereum. Lack of Market Penetration: This project depends on attracting users and/or third parties providing hosting services to CREDITS at the intended level or at a level sufficient to become or remain useful or viable. Their strong point of not using mining can be their weak point as well as incentives to run servers for their blockchain are less than running a Bitcoin or Ethereum Node. Any such lack of use or interest could negatively affect the development of CREDITS. Competition: They face heavy competition, not only from other blockchain based companies, but also from the likes of Microsoft and IBM. Need to pay for every transaction: Users need to pay for all computations on their network, exept for reading operations, which makes their platform less suitable for commercial dApps which are often based on monthly payment subscriptions. Regulatory Risks: Their regulatory status is unclear or unsettled in many jurisdictions. It is not known if, when, or to what degree different jurisdictions will interpret existing laws and regulations or adopt new laws and regulations that could adversely affect them. We think that CREDITS will be a good investment. If they manage to go live with their mainnet before the competition does, they will have a huge potential. Their product addresses some of the most pressing issues plaguing blockchains today. Their smart contract code is more advanced than that of Ethereum and they have the benefit that they where able to design their blockchain from scratch. Incorporation status CREDITS.COM PTE. LTD.